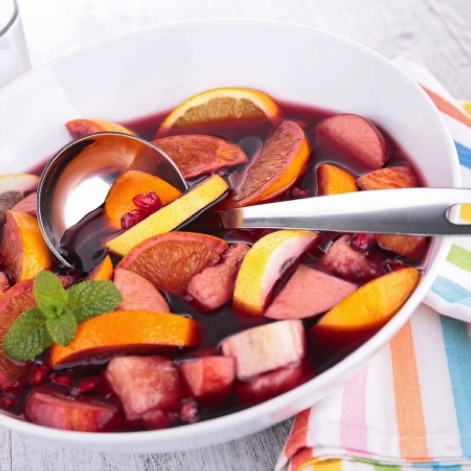 As far as wine cocktails go, sangria is the fan favorite for wine lovers looking for a light way to cool off when temperatures take a steep upward turn. Sangria is a traditional drink in Spain and Portugal and one that comes with a standard recipe and a million iterations. 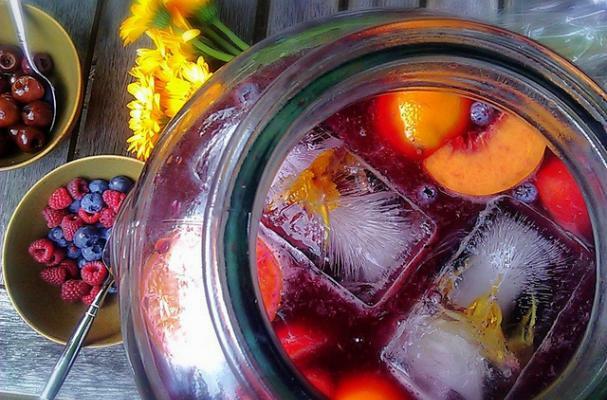 The basic sangria recipe consists of wine, fruit, brandy, and sugar. All the ingredients are mixed together, left to chill for several hours while the flavors fuse, and served nice and cold. Though the basic recipe stays the same (wine…and then some), sangria is immensely forgiving and is a wide-open invitation for wine lovers who want to fool around with new ingredients. Though the primary liquids in sangria are wine and brandy, delicious drinks have resulted from tossing in a fruit juice such as orange juice and lemonade. Concentrated ice tea can also make a delicious addition and add a more subtle flavor. Soda water, orange soda, or cheap wine spritzers can serve to stretch your sangria, while at the same time adding a zesty effervescence to every glass. Keep in mind that bubbly add-ins should only be incorporated right before serving, otherwise you’ll wind up with a diluted drink that falls flat. As for the wine, both whites and reds are welcome. Young, fruit-forward wines with supple tannins and bright acidity are sangria shoe-ins. However, everything comes down to what style of drink you’re hoping to create. Steer away from top shelf bottles, as their nuanced flavors will be completely lost in the crowd – certainly not worth the extra expense. Try out varietals such as Syrah, Chianti, Merlot, Malbec, Sauvignon Blanc, or Pinot Grigio. And finally, the real identity of a sangria comes from the mix of fruit that floats on top and makes for a tasty snack at the bottom of every glass. Choose to cut the fruit, float a few slices, or squeeze their juice right into the mix. You can even choose to buy frozen, for fruits that are out of season, or more difficult to prepare (such as cherries, peaches, or pineapple). 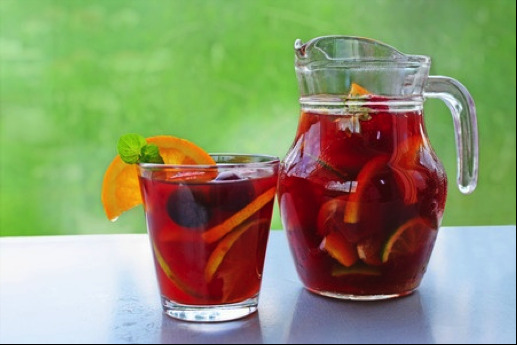 Citric fruits - oranges, lemon, lime, mandarin, blood oranges, and sweet pink grapefruit – add a refreshing lift, just be sure to avoid infusing your sangria with a bitter aftertaste and include slices (with the peel) only a few hours before serving. If your sangria is going to sit overnight, remove the peel and toss in small chunks of the fruit instead. When working with tree fruits - peaches, Asian pears, apples, nectarines, plum, etc. – remove all pits and only choose firm fruit, to avoid an unpleasant mush mixing into your drink. Berries are also a great option and can add another level of sweetness, allowing you to cut down on the refined sugar that the recipe calls for. Use everything from blueberries, raspberries, black berries, strawberries and cherries. If you’re looking to break out of the mold, mango, pineapple, kiwi, cantaloupe, cucumber, canned lychees, mint, and halved seedless grapes are fun ways to surprise your palate with new flavors. In fact, try freezing your grapes and let them serve as ice cubes! No matter what ingredients you choose to throw into the mix, never forget that the secret to a stellar sangria is giving it time to rest. Several hours chilling in the refrigerator will let all the flavors come together. However, if you’re making sangria in a hurry you can always mash the fruit slightly, or gently sauté the fruit with a bit of simple syrup just before you mix it in. Author Bio: Madeline Blasberg is a Certified Wine Consultant and the Official Wine Commentator and Reviewer for Etching Expressions, a company that specializes in custom etched liquor and wine bottles. Having spent time living in Mendoza, Argentina, Madeline was surrounded by wine both personally and professionally.